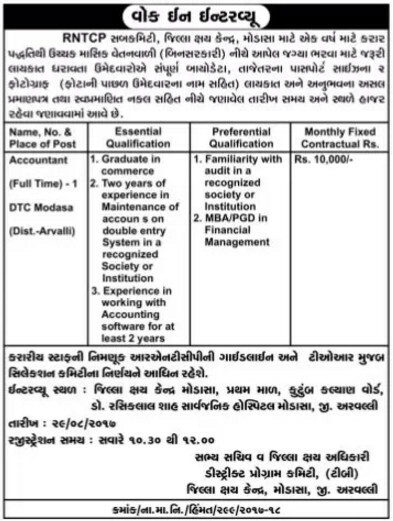 Revised National Tuberculosis Control Program (RNTCP), Modasa has published Advertisement for below mentioned Posts 2017. Other details like age limit, educational qualification, selection process, application fee and how to apply are given below. Two years of experience in Maintenance of Accounts on double entry system in recognized society or institution. Experience in working with Accounting Software for at least 2 years. Familiarity with the audit in a recognized society or institution. Venue: District TB Center Modasa, First Floor, Family Welfare Word, Dr. Rasiklal Shah General Hospital Modasa, Aravalli.